This Do Not Flush Aluminum sign provides a detailed list of items to not flush in the toilet. Remind people to be respectful & not throw away unwanted items in the toilet this 12” x 18” Do Not Flush Items List Aluminum Sign. These signs are printed on vinyl and mounted to heavy duty .063 aluminum. Two pre-drilled holes are at the top & bottom for easy installation. Aluminum has 1.5” radius corners to protect you from sharp edges and gives a professional finished appearance. For longer life of your printed sign, add lamination for a few dollars more. Lamination helps protect from UV rays to extend the life of your signs and is recommended for outdoor signage. For roofed parking garages, the vinyl print & aluminum will last for several years without lamination with no sun exposure. 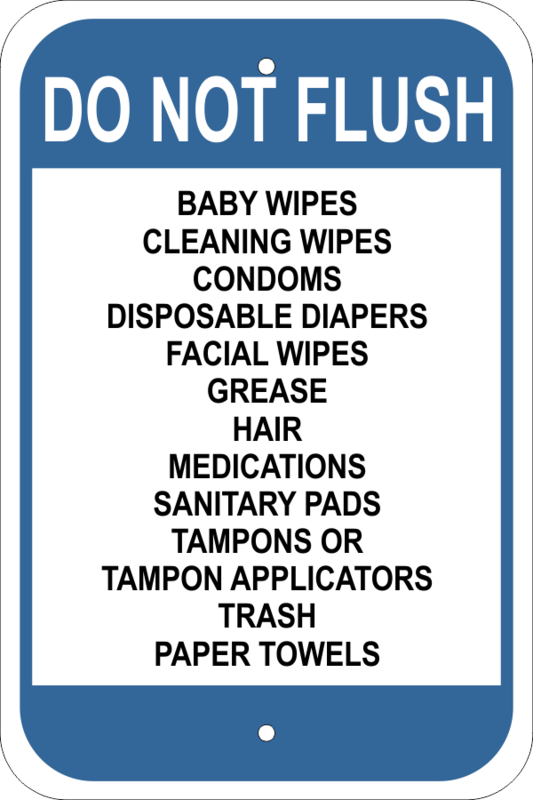 Order your Do Not Flush Items List Aluminum Signs today. Most orders ship the next day!